13 years since its last update, the new Nike Superfly Elite Racing Spike delivers a highly technical design to sprinters (100m-400m). Innovative spike plate with 8 fixed pins provides optimal grip to power through the finish. Dynamic Fit technology delivers midfoot lock down. Generative plate design combines zones of stiffness and flexibility. 8 fixed stainless-steel pins grip the track. Seamless woven upper for breathable comfort. Zones of ventilation and structure are engineered into the material. The weave is inspired by seat belt webbing to increase tension during acceleration. 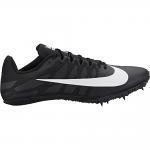 The Nike Superbly Elite are very light and flexible spike it helps in 100 mas sprints.